In the 1870s, the Cheyenne People and the Lakota People were at war. 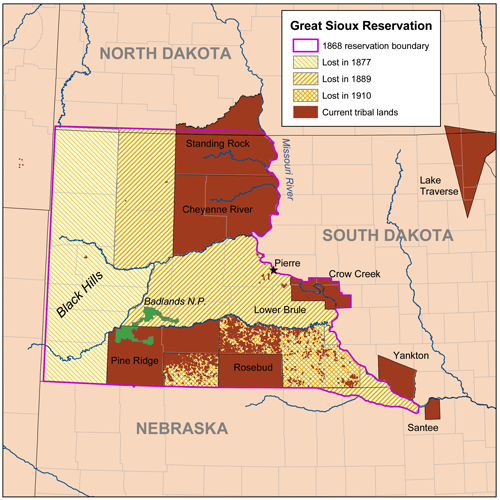 When the war was over, the U.S. government broke-apart the Great Sioux Reservation - which had existed by 1868 - into smaller areas. One of those smaller areas is the Cheyenne River Sioux Reservation. On August 12, 1990, Sue Hendrickson - a field paleontologist - was exploring an area on that reservation. Her colleagues had paid $5,000 to Maurice Williams - owner of a particular parcel of land on the Cheyenne River lands - to look for prehistoric finds. This map depicts the general location of the Cheyenne River Sioux Reservation. Map image from "Homebuyer Education and Counseling: Examining Rural Provider Networks in Texas, Florida and South Dakota." Online, courtesy Housing Assistance Council. Bos, Carole "Cheyenne River Reservation - Resting Place of T. rex Sue" AwesomeStories.com. Oct 07, 2013. Apr 18, 2019.